If you have ever had to spend hours sitting on the floor of your workshop working on equipment, you know it can be hard to move across the workshop floor, or to stand, sit, kneel, and bend while you work. You may have sat on a chair, or cushion, but had to move it every time you changed position, and the chair or cushion you sat on may not have provided support or comfort. When workers have disabilities or other physical limitations, including chronic pain conditions, it is even more difficult to get down on the floor to work. 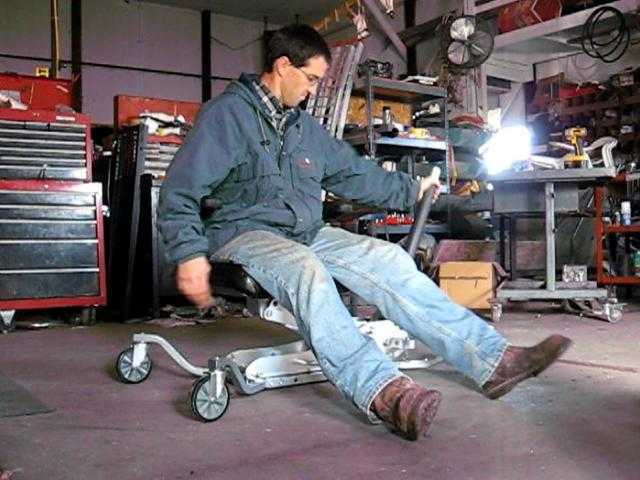 One solution is a Lift Creeper, a mechanic’s creeper with a padded seat and floor jack that will lift the operator from a kneeling height to a sitting or standing position without using their legs. The seat is a comfortable chair which provides back support and cushion, the armrests provide additional stability while seated, and give the worker a sturdy support to push themselves into a standing position. The wide wheel base makes the Lift Creeper stable, although you should still be careful about tipping it over if using it on uneven surfaces. Workers can use their arms and hands to push and pull the creeper across the floor and into position, or they could use their legs to move it. Some lift creepers will recline to allow the worker to lay on their back to slide under equipment. Other lift creepers will lower to 8.5” seated height, but do not recline. Lift Creepers are available in manual (hand-pumped hydraulic lift) or power (electric powered lift) versions. One Ohio AgrAbility farmer who uses the Lift Creeper is able to spend many hours working on his equipment because the seat provides support and cushioning. The , and the rolling creeper allows him to move across the floor without having to get up and down repeatedly, which would be difficult because of back and neck impairments. The ability to repair his own equipment, and not aggravate his back and neck while working has increased his productivity and helped him manage his pain. Working on the equipment does not give him days of residual pain, as it did in the past when he worked with a mechanics creeper, which did not have the back support or the ability to raise him to a standing height. One of the missions of Ohio AgrAbility is to work with farmers with disabilities to identify ways to make changes or modifications to equipment, facilities or worksites to allow the farmer to continue farming. Another mission of Ohio AgrAbility is to offer resources and education to all farmers on how to reduce the risks of injury and introduce modifications and technology that help farmers stay safe, and work more efficiently.